Puerto Viejo is on the Caribbean coast (like we mentioned) and known for its beaches ... hello warm, dark sand! 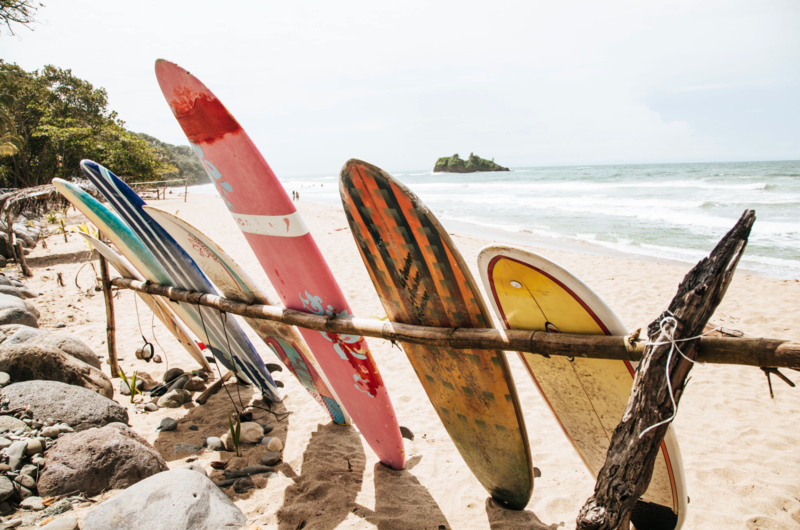 If that isn't enough you can surf, eat delicious food, and even visit a Jaguar rehabilitation center. Interested in spending time in Central America? Come volunteer with ILP for a semester! Learn all about what your experience will be like in our guide. This is a favorite of ILP volunteers who have gone in the past. It's gorgeous and the perfect place to spend time relaxing and swimming. This beach is a couple miles from town and you can either rent bikes and ride right to it, or jump in a taxi to get there real quick — totally depends on how much time you have and what your group wants to do! Once you get to Punta Uva you will find little shacks where you can rent kayaks and paddle boards for only a few bucks per hour. Grab a kayak, paddle around, and pray for some luck that you might see sloths, monkeys, and turtles! Playa Negra is really close to the city and has warm, black sand. The water is pretty choppy so unless you are surfing or boogie boarding it's not the best swimming beach. We'd grab some snacks, a good book, and spend time laying out in the sun. This little white sand beach is a great area with beautiful water. Locals walk up and down the beach selling yummy treats, visitors snorkel in the calm water, and there's a shipwreck not too far offshore. This is the perfect place to swim, people watch, and relax! Biking is a super easy and fun way to get around town and get out to different beaches. Most hotels and hostels will provide bike rentals, so you don't have to search too hard. Plan on about $6-$8 USD for a 24 hour rental. The Jaguar Rescue Center is said to be the best rehabilitation center in Costa Rica and a good place to visit if you love animals! Don't be fooled by their name though, the center rehabilitates a lot of different animals and actually doesn't have any jaguars. You'll be able to see sloths, anteaters, toucan, monkeys, owls, and more. During your tour you will be shown the different animals, learn about the work the center is doing, and learn more about what you can do to help these animals. And, your entrance fee is used to help the animals with their needs like food and medicine. Walk through cocao farms, learn how it is processed, see the chocolate being made, and of course, you need to eat it! Cocao is a big deal in this part of Costa Rica and these tours aren't only delicious, but a great way to learn more about the area and culture. Caribeans is a popular tour company in Puerto Viejo. There aren't tour times, so just show up whenever and be ready to pay the entrance fee of $28 USD. If you're looking for a little more high adventure in the area, white water rafting is going to be it. The river stretches 18 miles and you'll hit over 50 rapids. There's different tour options out there, and we've heard good things about Caribe Tours — they offer a full day trip that costs about $99 USD a person to give you a reference of what you're looking at. If interested, book through Caribe Tours here. Traveling by bus in Costa Rica will usually be the cheapest option, and getting to Puerto Viejo is no different. And, for our ILP volunteers who live here for a semester, it isn't too far. From San Jose, hop on a bus, take a nap, and end up in Puerto Viejo in about 4.5 hours. Booking: Book tickets at the San Jose Atlantico bus terminal. Here's more info (bus schedule and terminal specifics) about that bus. 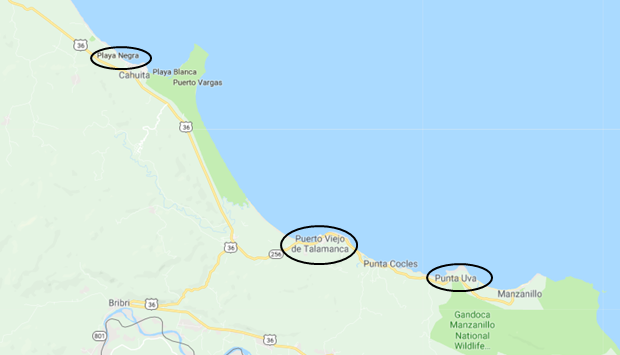 Uvita is technically closer to Puerto Viejo than San Jose is, but because of bus routes and forests you can't do it it in a straight shot. You'll need to take a bus from Uvita to San Jose and then follow the instructions above to get to Puerto Viejo. Booking: Grab tickets at your local bus station and check there for an updated bus schedule. The bus ride should take 4-4.5 hours. Flip Flop has a lot of different international foods, which means you'll find something for everyone! Thai and Indian curries, sushi, burgers, steak, and more are waiting for you. Oh, and the prices are great too. Soda Lidia is a local's hangout and makes traditional, yummy Costa Rican food. Make sure and grab rice and beans while eating there, and their key lime dessert is very delicious! Address: There isn't a set address, but ask locals where to find it. It's behind the main road in the city. Nothing gets better than homemade bread and chocolate! This is a great little cafe that serves soups, sandwiches, salads, and of course lots of chocolate desserts! Try the PB&J where the bread, peanut butter, and jelly are all made from scratch — YUM! Website: Here's the website for up to date hours and address. 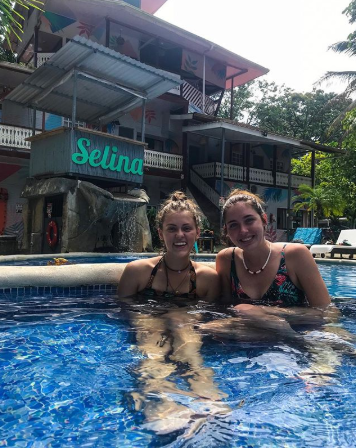 Hostel Selina is sooo cool. The common areas and rooms are really unique and you'll love the feel of the space. They have a lot of options when it comes to rooms you can book, the staff is helpful, and they even have a pool to hangout in. You can stay in a big dorm room like a normal hostel, smaller two-four people rooms, or even funky tents outside. Price: Dorms are about $18 a person and room prices go up from there. Roots Family has awesome reviews and won't disappoint. This bamboo house has dorm rooms and although it isn't anything fancy, it's unique and fun! It is pretty close to a beach and easy to find as well. Can't go wrong! La Ruka is another simple hostel that covers all your basic needs for a good nights stay! Everyone is extremely welcoming and the location is in a great part of town. 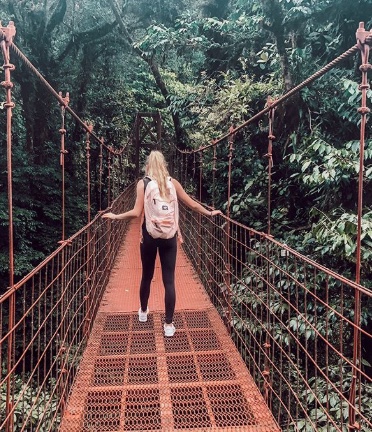 Costa Rica might be just what you're looking for! 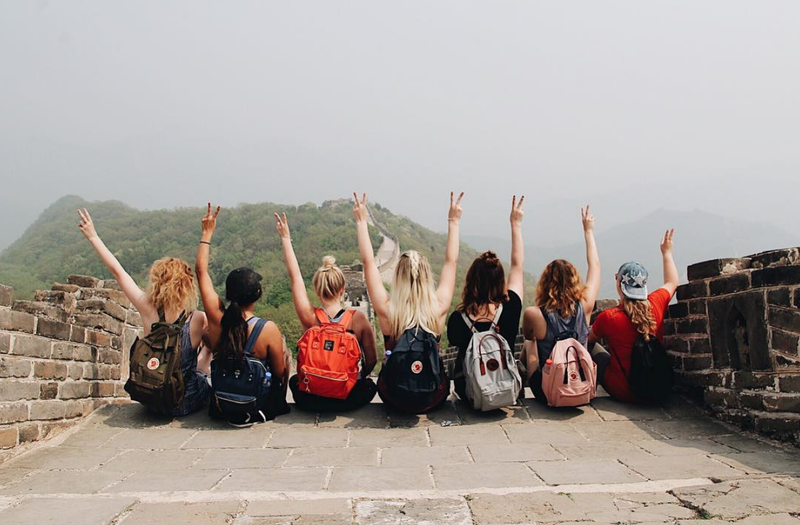 Spend a semester volunteering, exploring, and vacationing with ILP! Click the button below to start your application today!